← and it’s one, two, three, what are we artin’ for? When this poor kid went from the poor kid school to the rich kid school, the difference was extreme and immediately apparent, and yet it was not obvious just exactly what that difference was. In a purely physical dimension, this rich kid school was not terribly different from the poor kid school. There were teachers and students, there were classrooms and lockers. But there was, in fact, one overriding difference between the poor kid school and the rich kid school, and this was . . . trust. Simply stated, the rich kid school operated on a system of trust, while in the poor kid school, there just wasn’t any. In the poor kid school, the daily routine didn’t really have the look and feel of an academic institution. It was more like a prison camp. Head counts were constantly taken, and your presence was tracked at all times. “Cutting class” was a serious offense, although there wasn’t much point in doing it, as there was nowhere to go. If you wished to leave a classroom legally, this required seeking written permission from someone in authority over you. If your request was deemed to be reasonable (and this only came about after suspicious scrutiny of its merit), you were given a signed and dated “hall pass.” This was not a mere formality; the hallways were guarded by student “trusties” who checked all hall and restroom passes. If you did not have a class in a given time period, you had to sit in a supervised study hall, and you had to keep absolutely silent therein. Any disruptions (or attempts to communicate with anyone else in the study hall) were dealt with via varying degrees of a well established system of punishments. These included boredom (such as detention after school), ridicule, and, in cases of insubordination, corporal punishment. In the rich kid school, things were night and day different. If you had a class, it was generally recommended that you attend, as that would help you pass the test, but if you didn’t feel like going, well, that was your business. If you had no classes (or again, even if you did), you could pretty much do what you felt like doing. For example, if you felt like getting some fresh air, you could hike the nature trails on the beautifully landscaped grounds. If it was too cold outside, you could maybe go shoot some hoops in the gym. Otherwise, throughout the building there were lounges and various “common areas” with plush seating where you could hang out with other students. If you sought quiet and solitude, the library was the best choice, and by the way, if you wanted to take out a book, you just took it, and you returned it whenever you felt like it. There were no “trustie” hall monitors, there were no bars on the windows, and, unlike the poor kid public schools of that era, no corporal punishment. Actually, there weren’t any punishments, period, as there were so few rules to break in the first place that the very thought was somewhat ludicrous. The only punishment, if you can call it that, was other people telling you that you had hurt them by not honoring the precious trust they had placed in you. So just to repeat the point: in the poor kid school, there was little or no trust. In the rich kid school, there was an overabundance of it. In case you haven’t made the connection yet, one of the biggest reasons why poor kids are poor and rich kids are rich is this: it’s because poor kids have no trust, and rich kids have unlimited amounts of it. And trust, not money, is the basis of wealth. Trust is key to making the whole monetary system work. Every check you write requires trust on the part of the person taking it. When buying a car or a house, if no one trusted anyone else, we would all have to pay in cash. This of course assumes that the car dealer is willing to trust that your paper money is worth something, otherwise you’d have to barter with goats. And every time you use a credit card, your wealth of having that convenience, along with your having that instant access to a line of credit, relies entirely upon the credit card company trusting you to pay your bill. The cash in your pocket only has value because we collectively trust the Federal Reserve to maintain its value. Without our collective trust, it’s just paper. It even says “In God We Trust” right on the bills. Without trust, there is no money. So without trust, it is pretty much impossible to build and maintain wealth. To see how the emotions of trust overwhelmingly affect money and wealth, well, consider the recent screw-ups on Wall Street. When people talk about “the great recession,” many people try to define it in purely mathematical terms of there being a “loss of two trillion dollars” in the stock market. This is mechanical thinking and has nothing to do with the root cause. The stock market did not “lose” 2 trillion dollars in 2008. It’s not like someone put two trillion dollar bills in his pants pocket and accidentally ran it through the wash. What happened was, many people who had trusted the stock market stopped trusting it, and once that fragile sense of trust was gone, no one was willing to risk buying anything. Without trust, even the banks cannot do business with other banks. So the money didn’t just disappear. In fact, we’re not even talking about cash money here; the only thing that was truly “lost” was the presumption of the “market” being a trustworthy place. Nothing tangible got hauled out the door. If you look around, you will see that the desire for products and services is still out there, the manufacturing capacity is out there, the labor force is still out there, the natural resources are still out there, and the money supply itself is still out there. What was lost, and what we are still trying to rebuild, is the trust that is necessary to link it all together. Money does not go where there is no trust. And poor kids have very little trust to work with. The rich kids in the rich kid school were wealthy, but not by simply “having money.” They had trust. They had wealth in terms of having people in their lives that they could depend upon, and this gave them the wealth of confidence. They were also rich in the freedom that came from being trustworthy themselves. They were completely trusted to not burn down the school or get into knife fights at recess, hence they were given much greater freedom of movement. They were trusted to pass their exams, so they were free to study when they felt like it. The poor kids were not trusted, hence they had very little freedom. If no one trusts you to honor their needs and desires, then they will give you as little trust, and by extension, as little money, as possible. The more trust you command, the more money you have. Warren Buffet is rich because people trust him to safeguard and grow their money. The fact that they trust him creates desire to invest, and money is just a number ascribed to that desire. No trust = no desire. No desire = no money. Therefore, No trust = no money. A big part of wealth is having other people do stuff for you, and how can you use other people’s services if you don’t trust them to do a good job? When trust is absent, you end up sending them all home and doing it all yourself. When lack of trust makes you stop exchanging goods and services, the result is poverty. It is the same as subsistence farming. If you have cash but you can’t trust anyone to honor a contract, your money becomes worthless. The trouble with being a poor kid is, if you have grown up in a world without trust, how do you acquire it? Since one of the three primary beliefs of poverty thinking is that the universe is a negative place, how can you even begin to trust anyone? To a poor kid, trust is totally foreign. They have never seen it, much less experienced it. When you are a poor kid, you are usually surrounded by other poor kids and adults who are immersed in poverty thinking as well. This means everyone is assuming universal negativity. This negativity applies to how they perceive everything, including you, so they will just assume that you are careless/irresponsible, a crook, or worse. You’ll never even get a chance to prove you are trustworthy. And you may have had your own trust violated, so from that you learned to not trust anyone either. After all that experience in a non-trust environment, you simply may not any idea of how to behave as a trustworthy person. Handling responsibility – both getting it and giving it– takes practice. For poor kids, trust illiteracy is a huge problem. Some poor kids learn to trust no one. Others are so desperate to change their circumstances that they will trust anyone. Then there is the reverse, i.e., resistance to letting anyone trust you. Many poor kids have difficulty in letting others trust them, because they don’t even trust themselves, and are not sure of the extent of the implied responsibilities that come with being trusted. Or they may go the opposite extreme and take on too much trust, in the form of too much debt or other promises they cannot keep; when disaster inevitably strikes, despite the best of intentions, they become untrustworthy in the eyes of others, and again, poverty ensues from the lack of trust. 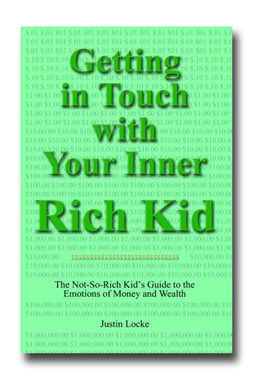 Rich kids grow up in an environment where trust is abundant, hence they learn how to handle it. They have people to trust, and so they have a reference and a backstop when they encounter people they do not trust. Poor kids don’t have this. Since poor kids are constantly exposed to lack and/or violation of trust, they must somehow adapt in order to survive. A common poverty thinking adaptation is to think that it is a sign of cleverness to never trust anyone. One can easily come to believe that one is “smarter” for never trusting anyone and keeping one’s money in a mattress. In an environment where you cannot trust most people, this is a reasonable and sensible response. (This gets reinforced via a rare psychic reward, i.e., a delicious feeling of relative moral superiority to everyone around you.) This blanket mistrust may seem like a sound policy, but in reality, it is poverty thinking. Over the long haul, it is disaster. True, you may be avoiding a few potential bad results, but then again, you’re never going to build anything positive either. If you are a poor kid, along with all the other stuff you didn’t get, you didn’t get the benefits of trust training. Rebuilding your trust in yourself, and moving towards living in a world where other people trust you and you trust other people, is a major step in going from being a poor kid to being a rich kid. – Take a piece of paper and write down the three worst trust violations of your life. That is to say, the three most egregious times when you put trust in someone and they somehow failed to keep up their end of expected fiduciary responsibility. – Have these extremely negative experiences with a handful of people universally impacted your “trust policies” of all people you encounter? – The people who violated your trust: were they members of your family, or were you perhaps drawn to them because they had energy similar to that of your family? If so, they are not a scientifically valid statistical sampling. – Now let’s think positive. Can you list at least one, and hopefully three, people who have consistently honored the trust you place in them? And if you can, do you feel these positives canceled out the preceding negatives, or do you default to being more suspicious than optimistic? – Next, have there ever been events in your life when people have put too much trust in you, for example, loaning you money that they knew you were not really able to repay? Or perhaps just putting some other kind of weight of responsibility on you, weight that you really weren’t ready for? Were their intentions honorable, selfish, or just ignorant? Were they deliberately taking advantage of you by making you take this stuff on? And was this something that they should have been doing for themselves? – And now, let’s consider your trust in yourself. Do you trust yourself to function in life, or do you think you are irresponsible? If you have failed in past endeavors, was this really an issue of not being trustworthy, or were you simply trying to do something that either a) was impossible for you to achieve at the time, or b) you weren’t really committed to in the first place? If your unmet goals were about pleasing someone else, and they were not based on your own core passions, this is not evidence of a lack of trustworthiness, at least not on your part. – Next, let’s think positive. Do a quick inventory of all the people in your life that you do trust. – More importantly, to what degree do you trust them? – For example, you might trust your teenage daughter with a babysitting job, or your teenage son with mowing the lawn, but would you trust either of them with the keys to your new Ferrari? The purpose of asking these questions is partly to just address and grieve the emotional injuries so as to “clear the board,” and to begin the process of pondering the extraordinary complexities of managing the emotion of trust. Remember that there are major financial companies out there that do nothing all day but collate data about how trustworthy everyone is. Some people have high trust/credit scores, some have lower. There’s no reason why you can’t do the same with all the people in your environment. Knowing who you can trust, and to what degree it is appropriate to trust them, is an important skill in being a rich kid. If your perceptions have been clouded over by a few egregious trust violations in your past, and you are dealing with this by simply not trusting anyone, that is poverty thinking. In the poor kid school, there was no trust, and in the rich kid school, there was an abundance of it. We want you to be a rich kid from here on out.